He told the Political Thinking podcast he and like-minded colleagues will stop a no-deal exit "whenever" - even if Brexit is delayed until the summer. MPs will get the opportunity to vote on a no-deal exit if Parliament rejects Theresa May's deal again this month. Mr Ellwood suggested the PM may have to pursue a "softer" Brexit to build a Commons majority for her deal. Asked by presenter Nick Robinson whether this could mean the UK ultimately staying in some form of customs union with the EU, he replied "possibly". Mrs May has said she will bring the withdrawal agreement she has negotiated with the EU back to the Commons for a second time by 12 March. If it is voted down, MPs will have the option of either supporting leaving without a formal agreement or delaying the exit date by extending the Article 50 process. Mrs May was forced to concede a vote on extending Article 50 after a number of ministers who want to retain a close relationship with the EU after Brexit threatened to resign unless she ruled out the prospect of the UK leaving later this month without a deal. However, the PM has refused to rule out the UK exiting this summer without an agreement if, as expected, the EU agrees to extend the process by about three months. Mr Ellwood, who backed the PM's deal in the first Commons vote in January, told the Radio 4 podcast that the UK would be in "uncharted territory" if it did not leave on 29 March. 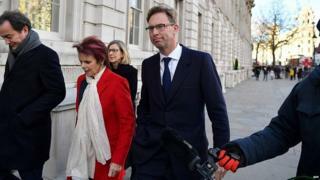 But he said the days of Mrs May having to "bend over backwards" to placate the European Research Group of Brexiteer Tory MPs, many of whom believe a no-deal exit is better for the UK in the long term, were over. "I hope it is very clear that if it was the European Research Group's intent to take us to no deal, we will stop that, whenever," he said. "No deal is not good for Britain. It will damage Britain in so many ways. No deal is not something we can contemplate." Mr Ellwood said he would not quit over the issue and urged Tory MPs who wanted to keep close links to the EU to stay and fight for their beliefs, suggesting the tide was moving in their direction. "If we are then to seek some form of consensus in Parliament that honours the referendum result then you are probably looking at an even softer form of Brexit than we have currently got," he added. The PM is seeking to re-work her deal to reassure MPs the UK will not be stuck indefinitely in the backstop, - the controversial agreement to prevent a hard border in Ireland - and have to follow EU customs rules. Former Brexit Secretary Dominic Raab said the PM must "face down" the EU over the issue and show that the UK would not be "shoved around". "By suggesting to the EU that we might delay Brexit or take no deal off the table, it weakens the negotiating leverage in delivering the very aims that the government has set out," he told BBC Radio 4's Today programme. "And that's what I think is so frustrating at this point in time."